Because of their high percentage of green blood (at least 75%), Emerald Spaldings are a popular choice for those who love the beauty of the green subspecies but not their aggressive or flighty tendencies. 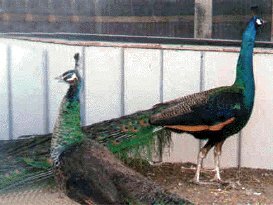 Type of mutation: Emerald Spaldings are a hybrid of the India Blue and Java Green peafowl. Emerald Spaulding are distinguished from regular spaldings because they are required to have at least 3/4 green blood, although it is often 7/8 or even higher. Peacock Coloration: Males are extremely similar to greens and are sometimes indistinguishable. The neck is green and the wings dark. As well as the white facial patch, emeralds also have a patch of yellow and a tint of blue, characteristics of greens. Peahen Coloration: Hens vary greatly within this variety. The neck is solid green and iridescent. The chest and wings are varying shades of dark brown and rust. Females also have a patch of yellow and tints of blue in their facial patch. Origin: Emerald Spaldings came out of extensive genetic work with spalding peafowl. 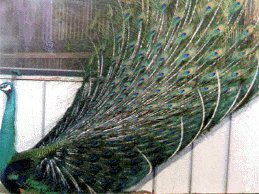 Many individuals attempted to breed birds that would retain the beauty of green peafowl but be better adapted to captive life. Emerald Spaldings are less flighty and aggressive than greens, and can better deal with cold weather. However, they are still much poorer in these regards then India Blue and its variations. Do they breed true? : No, Emerald Spaldings will not breed true, for the offspring will have varying degrees of green blood, many of them not enough to qualify the necessary 3/4. Mature Emerald Spalding male in display, photo courtesy of Alex Ancona @ Ancona's Peafowl. Mature Emerald Spalding male, photo courtesy of Alex Ancona @ Ancona's Peafowl. Pair of mature Emerald Spaldings, photo courtesy of Alex Ancona @ Ancona's Peafowl.